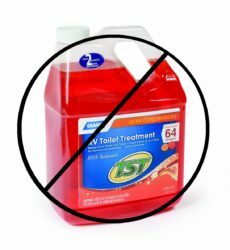 We’ve been pretty consistently using TST Orange liquid tank treatment over the years of our RV’ing. Occasionally, we’d pick up the packets instead of the liquid, but usually the liquid. It had performed pretty well (we thought), but in our recent trips out west in the heat, it simply didn’t hold up. Each time we’d flush either toilet ( mid or rear ), the foulest stench would emanate throughout the coach (cause the AC’s are on) and it’d take easily a few minutes to dissipate. It was so bad, I ended up troubleshooting the vent system for the black tank to ensure there wasn’t a disconnect in the wall where the vent line ran, etc.. VERY horrid smell. We figured out that it was just that the holding tank treatment wasn’t holding up. We tried double and triple doses with only very limited success. As the tank crept above 50% full, the stench would return. Watching a YouTube video from LoveYourRV, I caught him talking about Happy Camper holding tank treatment and decided it couldn’t hurt to try it. All I can say.. is WOW. We’ve had several 90+ degree days here in Vegas, days that would normally send us rushing for an exhaust fan after a flush.. and NOT A SINGLE WHIFF of the tank has come forth from the belly of the beast! Even when the tank was up around 80% full, still nothing. Completely odor free. Now, I will note that the Happy Camper treatment is considerably more expensive ( by almost 3x ), but I was trying to use 3 times the dosage of the TST Orange and still had odor issues, so on a per-dose of effective odor relief, it’s a win. And on a WAF (wife acceptance factor) scale, it’s not even close. Happy Camper‘s we now are. 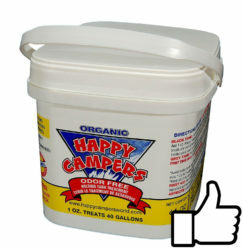 We’ve been using Happy Camper since 2006. Nine years in our old rig and now in our new one. We learned about it from some friends who had a g-d awful odor problem and tried everything including those vortex thingies on the vent. Nothing worked until they got Happy Camper. Well, we really didn’t have a problem, yet, but, hey, my momma didn’t raise no dummies, so we converted to the stuff right away. Never, ever had any kind of problem. When parked we keep the grey tanks open so when we move and will be on the road 3-4 days I put it in grey tanks, too. I think if we ever stayed somewhere a while I would put it in grey tanks every month or so. I love that it’s enviro friendly. Great stuff.